Happy Ram Navami to All of you. 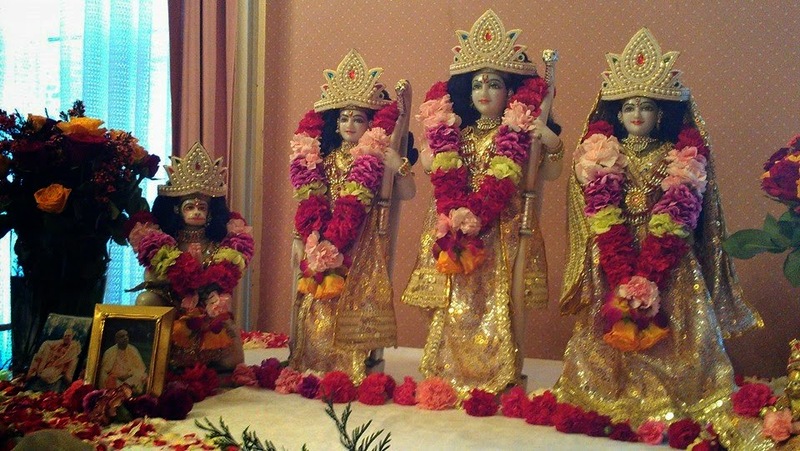 Today (Yesterday in India) April 9th, 2014 is Sri Rama Navami, a Hindu festival, celebrating the birth of Lord Rama to King Dasharatha and Queen Kausalya of Ayodhya. The festival falls in the Shukla Paksha on the Navami, the ninth day of the month of Chaitra in the Hindu calendar. Thus it is also known as Chaitra Masa Suklapaksha Navami, and marks the end of the nine-day Chaitra-Navratri celebrations. names of Lord Vishnu (Vishnu Sahasranama) and my Mind gets absorbed in the Divine Consciousness of Rama, which is Transcendental. I offer obeisances to to Lord Rama, who was the best amongst the great kings of Raghu-kula, who wields his great bow and arrows, who has a complexion and softness like that of a blue-lotus, and on whose left sits Goddess Sitaji, his dear consort. Thanks Amrita.Haven't seen any new post from you or did I miss it.? Festival greetings to you too!